Students who have taken advantage of the program are very enthusiastic. Max and Abby were two visitors who stopped by to visit with the therapy dogs. Max, from Solebury, had just endured final exams in world geography and macroeconomics with a third exam scheduled in environmental science within the next hour. He was stressed to the “max.” Knowing that therapy dogs from the Nor’wester organization were in the Rollins Center solarium, he stopped by to spend time with the furry stress busters. “Spending time with the dogs is a great decompressor,” said Max. “There’s something so simple about them. They have no worries; they are just happy to see you and want attention.” After spending about 20 minutes with the dogs, Max headed out to tackle his last exam in a more relaxed frame of mind. Abby, from Holland, was in a bad mood after finishing a stressful final exam when she passed by the solarium and saw dogs and students mingling. Being a dog lover, she detoured to join the crowd. After hanging out with each of the 5 dogs present, Abby left with a big smile on her face. “Being with dogs is always a mood booster,” she said. 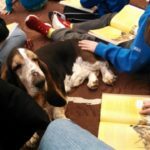 Not only are the dogs wildly popular with the students, they also get many visits from college professors, staff, and administrators. 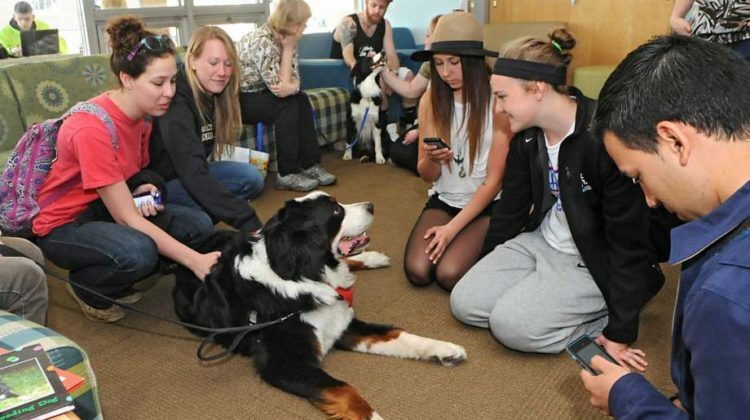 Therapy dog teams are currently scheduled to be on campus April 30, May 2, May 6, and May 8. Confirmed dates will be posted by the Student Services Office. 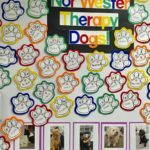 In addition to the Comfort Dogs on Campus Program, the college eventually hopes to use the Nor’wester therapy teams for other student services such as the AACHIEVE program and guidance-focused issues. Nor’wester has such a demand for college level services that we are calling for more therapy teams to join the Comfort Dogs on Campus force. New teams can get an application and instructions on accessing the procedures to acquire the three required Pennsylvania security clearances in the Get Involved section of our website.